Sushi is a delicacy loved by many. While restaurant-made sushi is great, homemade sushi is better and so easy to make. In order to make sushi at home, all you really need is your favorite ingredients, a sushi roll mat, and a sushi knife. Getting your hands on the right sushi knife may prove to be a little difficult, especially if you’re a beginner and don’t know what features to look for in the best sushi knife. But don’t despair, because we have done some heavy research and picked some of the best sushi knives in the market. We have also added their reviews so you can make an educated decision. Read on to learn more. A lot of beginners ask us why they can’t just use a normal kitchen knife such as ceramic knives or butcher knives to cut and prepare sushi. The answer is simple; a kitchen knife isn’t as long, sharp, or strong as a sushi knife. Sushi knives are designed to be thinner, sharper, lighter, and more maneuverable. They are designed this way to allow you to make all kinds of cuts and get the thin slices you need to make amazing sushi. While there are many kinds of sushi knives you can use, a basic sushi knife is good enough to make many kinds of rolls and sashimi. There are many types of sushi knives available in the market. The difference in the shape and type of knife depends on the use you put it to. There are different knives to make various precision cuts, debone fish, cut bones, and fillet fish. However, there are four broad categories of sushi knives you will encounter in the market. This is the most common type of sushi knife in the market. It has a long, thin, sharp blade that is longer than the handle. It is used to cut fish, and prepare rolls and sashimi. This is a short knife that is used like a cleaver. It is made to cut through bones and pull away cartilage from longer pieces. It is a sharp and strong knife. This knife has a rectangular blade that is used to cut vegetables and peel skin. It is perfect for making swift, fine cuts. This knife is mostly found in the ‘western’ part of the world. It is a well-rounded solution for preparing sushi. The ridges on the blade make for a sharper cut. The very first thing to check is the sharpness of the knife. The secret to cutting just the right slice it is to use a really sharp knife. Don’t just check to see if the blade is already sharpened, but also check if you can easily sharpen it by yourself as well. Another important thing to consider is how long the knife retains its sharpness. You shouldn’t have to sharpen the knife after every few uses. The Shape: The shape of the knife is really important when it comes to cutting and preparing sushi. Make sure you have an idea of the shape of the knife you want to buy before you head to the market. Generally, all sushi knives should be thin and long. Thinner blades make for more precise cuts. You can’t put any knife to good use if you can’t hold it properly. So make sure you check the grip of the knife before you buy it. A well-made sushi knife should have a comfortable handle that is easy to grip and doesn’t slip from your hand. Also, check if the grip fits well for both left-handed and right-handed use. The durability of a sushi knife depends on two factors; the composition of the knife, and the care you put into its maintenance. While the latter is something you can control after you buy the knife, the former should be checked before you make the purchase. While knives made of carbon steel are the sharpest, they require a lot more maintenance. Knives made of composite steel have sharp edges and don’t require much maintenance but they are really expensive. Stainless steel knives don’t rust and are affordable but they aren’t as sharp as other knives. Take a look here at how you can clean your knives. Getting your hands on the right sushi knife is imperative to making delicious sushi. Here we have reviewed some of the best sushi knives in the market. 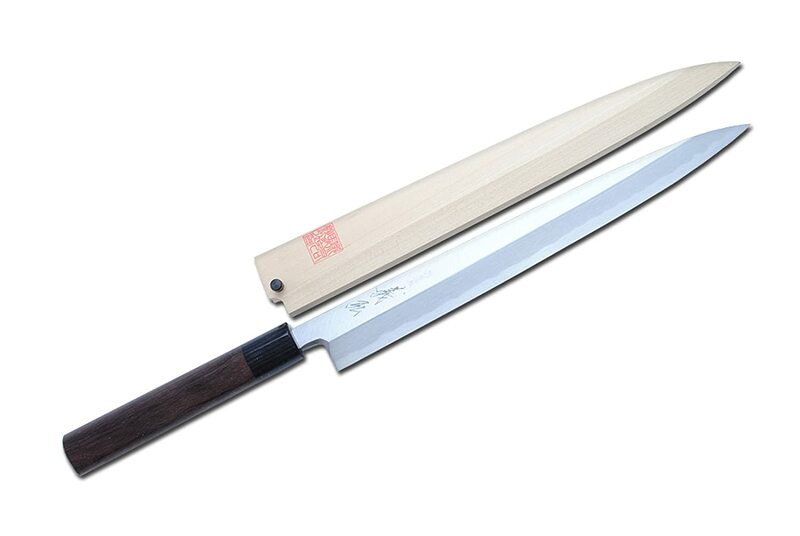 This long slicing Yanagi knife is perfect for slicing thin slices of sushi and sashimi. Though this knife is priced a little high, its high carbon construction makes it sturdy and made to last. The blade itself is rust-resistant and can become very sharp with just a little whetstone sharpening. Also, the blade retains its sharpness for a long time. This sushi knife is perfect for beginners because it comes ready to use and has a comfortable D-shaped handle that is easy to hold. The handle is made of rosewood and can be used by right-handed and left-handed users. It also comes with a Magnolia knife sheath for safe storage. If you’re looking for a sushi knife that is better suited for intermediate to expert sushi chefs, then this may be the right knife for you. Chef’s companion is renowned for producing quality knives, and this one lives up to that reputation. The knife is easy to use and easier to maintain. The knife is made from a single bar of high carbon steel which makes it structurally sturdy and durable. The structural formula really stands out in the blade which can take a lot of wear and tear. 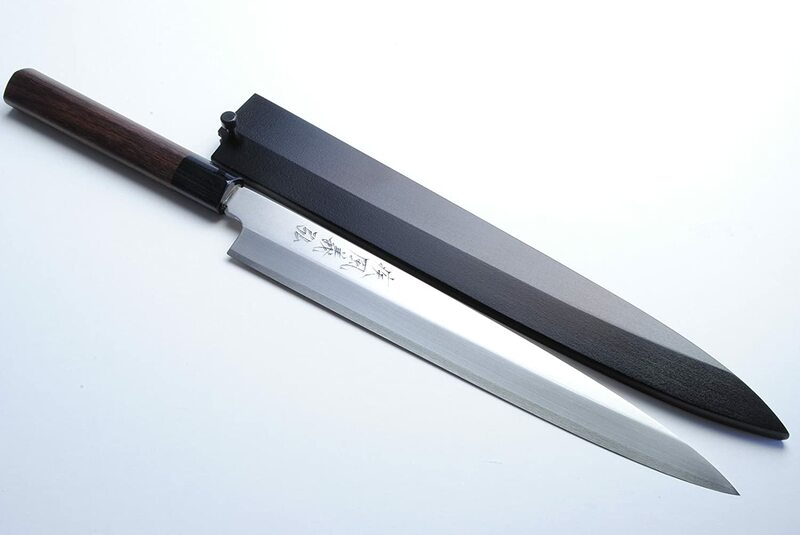 The traditional Japanese design and powerful composition of this knife, make it a dream to work with, especially if you have worked with sushi knives before. It is made with Hongasumi-grade high carbon steel that makes it both rust resistant and durable. Also, the blade is really sharp and retains its sharpness for longer periods of time. This knife is made to stand wear and tear while retaining its edge. To add to its charm, it comes with a lacquer-coated wooden sheath which looks as good as it functions. Though it needs appropriate care, the knife is built to last years. This sushi knife is as versatile in use as they come. The stainless steel blade is easily sharpened to a strong edge and is able to make the most intricate of cuts. It is also stain and rust resistant, which means it can stand a lot of wear and tear. This knife is made for beginners and experts alike because it allows the user to make any cut they want. The composition is sturdy and the handle is easy to grip. Though it is glued on, the handle is fixed really well with the blade and doesn’t come loose. The knife also has a certain decorative element to it, so you can set it up on any stand for show. This knife is made from high-carbon German steel, which boasts to be stain and rust resistant. The blade is sharp and retains its edge with the right care. The knife is pretty sturdy and affordable. This means that beginners don’t have to worry about being extra careful with this knife and can make mistakes essential to learning. The knife has a real wooden handle that is fixed well with the blade so it is easy to hold and use. 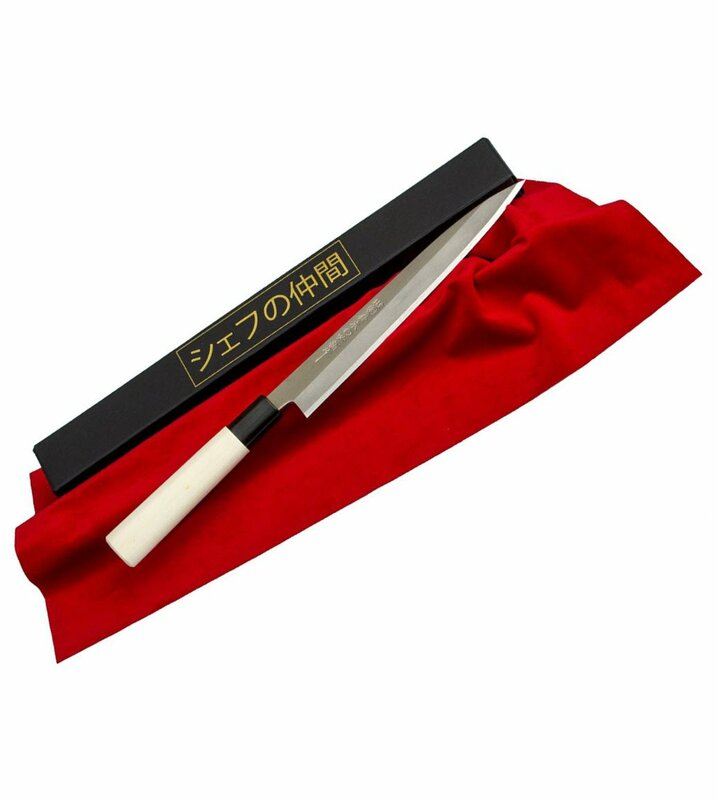 The blade is long enough to make precision cuts and take care of difficult compositions so it is a good investment for beginners and intermediate sushi chefs. 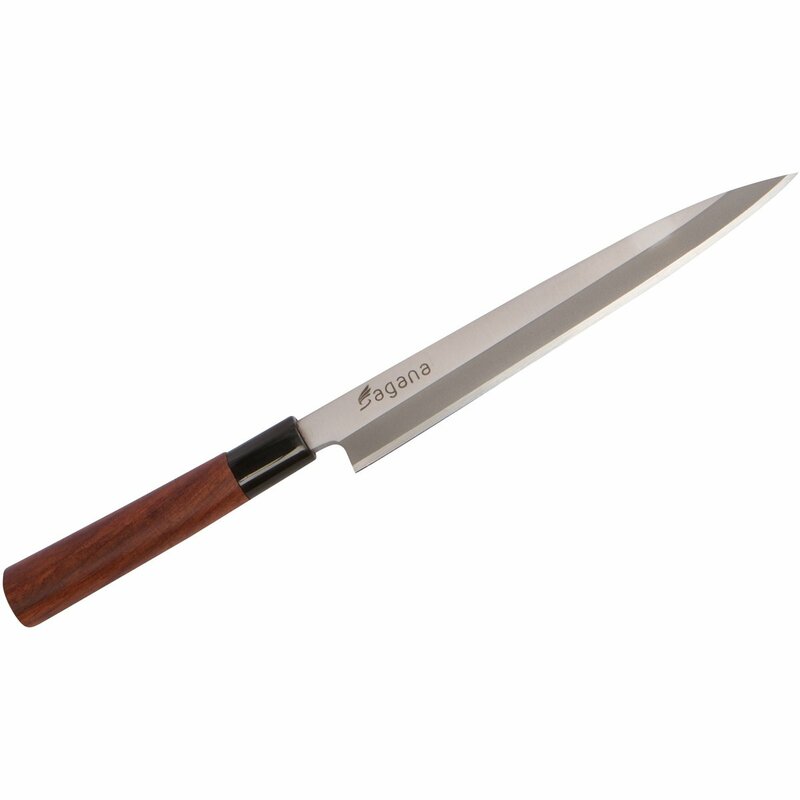 Though all the knives mentioned above are a great buy, our favorite of the lot is the Sagana Kitchenware Sushi Knife. 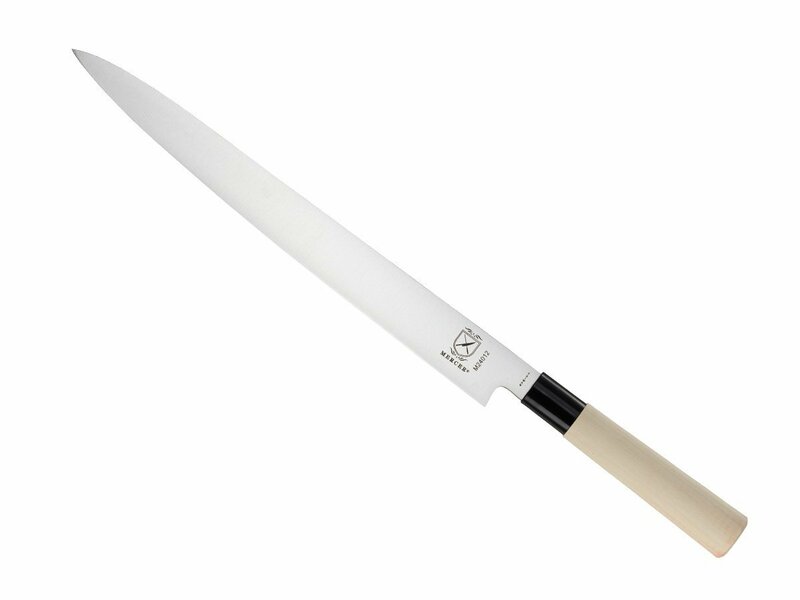 We love it because it has all the best features of a sushi knife and is really affordable. The knife is easy to use and versatile. It is easy to care for and requires very little maintenance. It isn’t dishwasher safe, but many good sushi knives aren’t. In fact, we like to clean sushi knives by hand anyway to remove difficult stains and dry them properly to increase their longevity. This knife is also our favorite because it can be used by beginners and experts alike and is an investment you won’t regret. Did you like this list? Let us know your thoughts in the comments section below.